If someone were hiking in the Sedona area 10 million years ago, they would see the Sedona red rocks partially exposed in an ancestral form of the Mogollon Rim, which itself was partly buried by lava from the House Mountain volcano. This aspect of the past landscape would seem familiar to us modern visitors in the area. However, some things were quite different, as the Black Hills were not yet uplifted above the not-yet-fully-formed Verde Valley. All this changed soon thereafter when the Verde Fault became active and raised the Black Hills. On its northeast side the Mogollon Rim had already defined an early incarnation of the Verde Valley and subsequent uplift of the Black Hills completed its final shape. 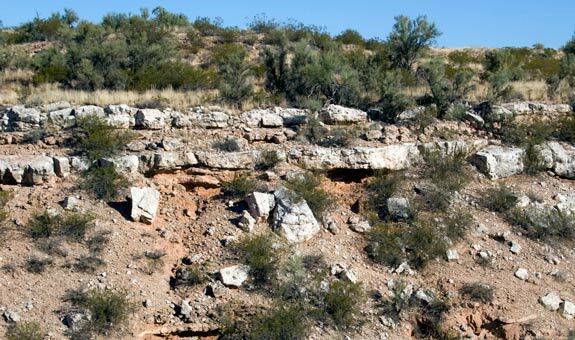 Faulting also had one other important effect on the landscape – it blocked the free flow of the Verde River such that a large lake began to form on and off the basin floor. The resulting lake deposits are known as the Verde Formation, which makes up the whitish cliffs seen at Montezuma Castle, Montezuma Well and Tuzigoot. The specific size of the Verde Lake was variable through time on the landscape and it likely was never a deep lake, often becoming shallow or even a dry playa. Changes in climate and precipitation determined whether the lake was expansive or diminished, with high periods of precipitation flooding the lake basin and causing the widespread deposition of white limestone. Dryer episodes would shrink the lake’s outline allowing reddish sediment from the Sedona and Mogollon Rim area’s to inundate and cover the lake bottom in red mudstone. These alternating rock types reflect the changing climates that happened during the lakes existence between about 9 and 3 million years ago. 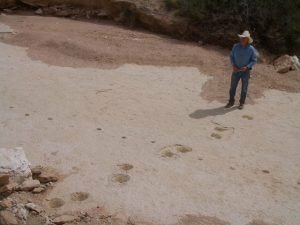 Some fantastic animals roamed the shores of this ancient lake and their footprints are sometimes fortuitously preserved in the white limestone. Giant Stegomastodon prints, as well as dire wolf and camel are also found. In one instance, the lower jaw of a Stegomastodon complete with 12-foot long tusks was found near the Clarkdale Cement Plant. Wayne Ranney is a geologist, trail guide, and author based in Flagstaff, Arizona. He completed his Master's degree in geology at Northern Arizona University by compiling a geologic map of the House Mountain volcano near Sedona. Out of this project came his first book, "Sedona Through Time", now in its 3rd edition and considered the foremost book on the subject. A few of his other books include "Carving Grand Canyon" and "Ancient Landscapes of the Colorado Plateau."